The night after I watched a documentary on the orphans of the Armenian genocide, I woke to the news that Boston was on lock down. I started to think and had a hard time stopping. Then I had a hard time thinking. Then I decided that it’s impossible to wrap your brain around the world. Literally. If you try, you’ll hurt yourself and your brain and you’ll become depressed or cynical. I know, because I like history documentaries and thinking. Did you know a great way to survive a long prison sentence for murder is to control your thoughts by creating something? That’s how the M-1 carbine was invented. And those two sentences alone are enough to BLOW my MIND. What the? How? TRUE STORY. Anyway. The POINT is I drew an apple (you weren’t expecting that were you). 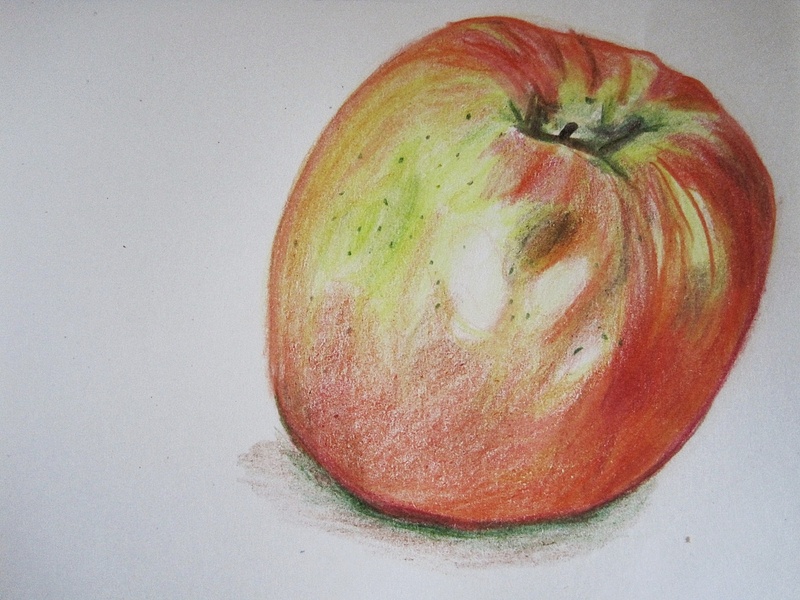 It took at least 15 different colored pencils to sort of capture the colors in an apple. 15 different colors and I could have used more. I spent an hour on it and I could have spent a day. This world is full of sadness, broken hurt, lonely people, fatherless children. This world is bombed and shot and hungry and dirty. It’s hard to keep the faith. It’s hard to believe that God is good, that He has the whole world in His hands. We wonder where His hands are, they can seem so far away from us. Until we look at an apple. It could have just one color. It doesn’t NEED 47 different hues that catch the light. I think the beauty in apples are a love letter from the master artist. They’re a comfort in dark days. I don’t have answers. I just have apples. This made me cry and cry. I love you so. You are the one person who always speaks my heart better than I do. I love you so, Dr. JoAnn. You are my soul mate. P.S. Can you please add your signature to the drawing of the apple, take another photo, and send me the jpg? I want to print and frame it as a daily reminder of what you've said, here. Really. Please. oh joann….. .i mean my word, dear…. you can draw?! (of course you can). but man, can you draw on my heart…. this post is exquisite b/cs of how necessary a reminder it is. love love love this. Magnificent. You are gifted, you are a gift. Oh my. Yes. I sit here thinking about how I vascilated from thinking TOO much all week to avoiding any real thinking at all. Even now I wonder how I am supposed to feel in this big, strange world we live in. And so the only coherent thought I have right in this moment is that if I could draw at all I would want to learn how to use all the colors and shades, to capture the beauty of the simplest things. I love this! Focusing on something else really does help. I am also one who thinks too much. I loved this…so very true!